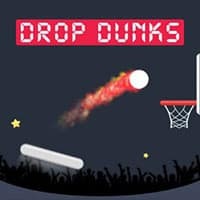 Drop Dunks is a great HTML5 game where you have 3 chances to score as many balls as possible! Test your skills in this awesome game! In this game you need to get the points, by bouncing the ball with moving paddle and throw it through basketball circle. By the way, you can collect the stars which appears during playing and it will count it like a points. Don’t let the balls fall down, with every fallen ball, you lose one life. Enjoy and have fun in playing this free online game. Make sure to check out Armshirt Juggle Game. You may enjoy playing it.